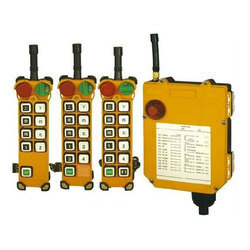 Wholesale Trader of a wide range of products which include radio remote control, radio remote control for eot crane and industrial radio remote control. With years of experience and knowledge in this field, we are engaged in offering an excellent array of Radio Remote Control that is mainly used in EOT Cranes, Hoists and other material handling equipment. Provided radio remote control is manufactured using high-grade components and progressive technology. 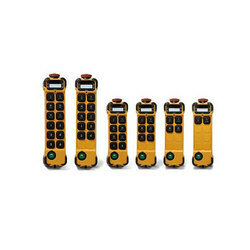 We offer this radio remote control after examining it on various quality parameters. Available in various designs and specification, this radio remote control is offered at industry leading prices. 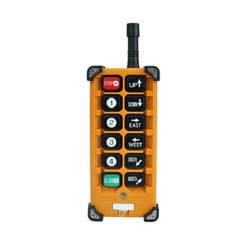 With up-gradation of technology Radio Remote Control for EOT Crane have undergone a tremendous change for the better in terms of safety, reliability, user friendliness, maintenance and inventory of spares. Normally with Cable control/ Pendant control, safety there used to belong electrical cable hanged from the E.O.T. crane which in long run get damaged or jammed. Also for the safety of operator and personeel during operation of EOT crane, in today's practice, the RRC is one must necessary accessory for EOT operation. Very useful in Workshop areas where materials and machineries are in hapazard condition or the high temepreature and a great height where personnel are not ready for frequent riding at the operator's cabin. We focus on safety, efficiency, and productivity and we put our heart and soul into perfecting the design and commission of our Industrial Radio Remote Control to the highest level. RF Channel could be changed by software. While interference occurs, system switch to a spare channel automatic. Eco power management system. Save on batteries. Up to 12 keys, single or double step pushbutton. Internal Boot Loader, up firmware to the date from Supplier’s website. Transmitter to the receiver, transmitter to transmitter could copy wirelessly.